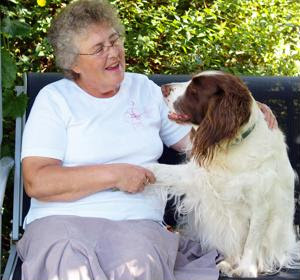 It's been shown that animals can provide great assistance for people dealing with all sorts of ailments from depression to arthritis, limited mobility and dementia. Simply petting a dog or cat can lower a person's blood pressure, and playing with a four-legged friend helps boost mood. Find out what kind of animals they like: First, it's important to determine if your clients have a preference for dogs or cats, as both can be trained as therapy animals. If they like dogs better, ask them if they would rather spend time with a larger or smaller breed. Explain: Discuss with your clients the benefits of pet therapy sessions. Mentally, spending time with an animal can reduce stress, sadness or loneliness. Therapy animals can also increase socialization and exercise, especially if your clients take a dog for a walk. Research: Many areas around the U.S. have therapy animal services, so do some research to find out what organization would best suit your clients and which ones do home visits. Then contact them to schedule a session.